Its been a writing spree since the release of my new album "Together Now" which makes me dually pleased to have content forming so freely for the next album, and slightly dismayed that this recent creativity came a spur to late to appear on my newest album. Despite that, pleased to have another podcast up just 2 days after the last instrumental demo, "Car Commercial". "Right for You" has a rock edge to it that brought out quite a productive solo after 4 hours of recording in total. I maintained a strong focus through the session and produced a brand new, full-length, and yes - FREE, song download from Danny Hauger Studios. Please subscribe and support my music and my new album! You might do what is right for you. Let my guidance be sight for you. And not what they decide for you. But when you make believe you lose. Look at the box they made for you. Break out any time you choose. This music bed would be perfect for a car commercial! Really, try creating a script in your head for your favorite vehicle and voice over the make and model. Its a sure thing. By the way, if you know anyone in song licensing, send them my way! DHXlive at Gmail. By the way, while we are driving by, the new album is approaching on the driver's side, take this exit and support my free music downloads now on iTunes or Amazon! "Together Now" is waiting for you, be the first of your indie music loving friends to have it! Its on iTunes now!! “When I’m Older” by Danny Hauger Copyright 2/20/2016 - on iTunes now!! The hours pass, the greener grass, that isn’t grown yet. I practiced all, the problems solved, was I wrong then? What’s the next thing, that will test me? Will I be losingsleep? Repeat the past, and then at last, then the future comes tome. Repeat the past, and then at last, I see the future comes tome. With these doors, when they will close, will not open upagain. If I show well, I will get sold out. I warn you. I will rise up in unforeseen skies and I’ll float away,float away, float away. We gamble, we bargain, the clock ticks, and the time wewaste. We wait. We waste. We wait. We waste. And we wait. I should have tried, to be more applied, I was bolder. If I show well, I will get sold and I warn you. I will rise up in unforeseen skies and I’ll float away,float away, I’ll float away. I literally have just finished recording "When I'm Older". About six hours of straight studio recording have produced one of the best songs I have ever written, the first studio session since the finish of the "Together Now" album that will be live on iTunes, Amazon, and all digital outlets this week! This new song has a beautiful groove to it and a surprisingly hard hitting chorus about the time we spent waiting, and sometimes seems like wasting, while waiting for the great moments in life. THESE ARE THE MOMENTS. Go out and live it, and help share Danny Hauger music, of course! Lets get "Together Now"! It is available now on Amazon! in Digital Mp3, and Audio CD! Help support my free download podcast by buying a song or the album today! Waxing and waning moons - each day brings us closer to the release of "Together Now" from Danny Hauger music studios. I heard from a few people surprised to see an early release appear and then disappear. Like the phases of the moon, "Together Now" needed to be eclipsed for a short time for the new version including a special version of "Slow Dance" and a re-worked title track to be submitted and distributed by CDBaby this go-around. So in about a week's time we can all welcome the new album, to be published in digital outlets everywhere! Stay tuned and enjoy this week's free song download, "The Thinnest Moon", one of my favorite story songs from my collection. Please help me grow my listener base by sharing my free song downloads with someone you care about! My free downloads reach more people when you subscribe, Tweet, and share my independent music. Thanks for listening everyone! In more than 68 countries and 102,000 downloads, I am sharing my songs with the world and you can help : ) Live on iTunes right now!! 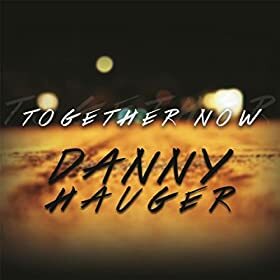 Danny Hauger music is proud to announce the arrival of "Together Now" on iTunes and Amazon this week! You can order now on Amazon for $8.99! Makes a great Valentine's Day gifts! Lots of love songs and romantic tunes on this new collection! be the first of your friends to have the newest indie and acoustic album from Danny Hauger studios! To celebrate Valentine's Day I am sharing a free mp3 download of my archetype song, "Losing Sleep". Enjoy this free song and help support my music by buying a song today on iTunes, Amazon, or Google Play by searching Danny Hauger! Enjoy a free song for that special someone in your life, send it their way for free!Thanks for listening to my music and please subscribe on your favorite podcast app! DOUBLE FREE DOWNLOAD DAY! Enjoy my instrumental guitar track "Valentine's Day" today on Valentine's Day - - how fitting is that?? Enjoy everyone! Celebrated Valentine's Day with Guster after a brilliant double set show at San Francisco's historic Fillmore! It was a pleasure to chat with the band after the show and grab a quick photo. Yes I named this song "Goose Migration". Just listen to the guitar solo, and try not to picture honking Canadian geese. See what I mean! There is a flighty, altitude drive guitar playing the notes to the chords, and then honking in are some heavier notes that cheer on your imaginary flying birds in this instrumental from Danny Hauger studios. This is a free song download. Its a silly title admittedly, but I like the song and I didn't want to archive it without airing it on the podcast. So it takes flight! Enjoy now! Memories of birds class are fluttering through my mind as I type. I logged back in an hour later to change it geese, then left it, was that right? I guess I winged it. Together Now is on iTunes, help support my independent music! I hope you will enjoy this new instrumental song. Please share it with others, and then support my free music downloads by buying a song on Amazon or Google Play! "Together Now" will be live soon on iTunes as well! You can follow the podcast by subscribing and keep track of my Twitter updates @DHXmusic. Thanks for listening Earth! Four months ago I began recording sessions to plan for the 2016 album release of "Together Now" [Pre-sale on Google Play for $4.99]. I wanted to do something different to follow up the successful release of the rock-based album "If I Grow up", last year. I wanted to push boundaries further with instrumentation in recording quality. I purchased some additional equipment and got to work recording. I was looking for more hard this year. I was looking for less excuses when I sat down with my guitar on what I could do. I also wanted less instrumental in more alternative and modern rock influence. The Pre-release of "Together Now" is available on Amazon! Also on iTunes!! When I started recording, I took more time for better recordings and longer sessions. And isolated spaces and use different environments. I used a variety of techniques in microphones. I kept the same persistence about not wanting things to be too stereo produced. I didn't want things to be too clean. I still wanted to keep autotune out of the picture. I sat down in within a week I have three brand-new songs that I loved. I realized I still had a passion for songwriting and wanted to push my career into a new direction and my music should follow as well. I thought of the theme of togetherness. I wanted to bring aspects of harmony and relationships in the greatness that is within people. In this edition of Danny Hauger podcast, I explore the album plane cuts from each track. The album will have 18 total tracks. It is already available for pre-sale on Google play. In less than two weeks will be available on digital stores everywhere. I will also be releasing physical CDs from Amazon on demand. This year will be the biggest in my life. Events, careers, and hopefully musical appearances will follow. Passing 100,000 downloads was a big deal for me. I've never spent money to advertise. I never took advantage of my five years on a major radio station to push my own music. It is always been my own project on the side. I hope that more more people would connect and continue to find and share my music. It is happened and has gone to every continent on earth. I'm so grateful for the support and help more people will share my free music and will support my music career on the side by buying one song or maybe even the album. I reciprocate and support Artist and content that share my messages and my interest. Its Superbowl Sunday, so I am thinking that most people will be wrapped around the sofas today. I am picking the Denver Broncos 28-21 over Carolina. Concluding, I hope more people will keep enjoying my music for free and share them with each other so that we can all be together now. Thank you for supporting Danny Hauger music. Subscribe and come back often for free music. The album "Together Now" launches on 2.9.16. The last week or so I have heard more references to my song "The Question" than I have in years. This song was given a big push in 2009 when I performed it in three continents including Paris, London, Vancouver, and Los Angeles. During this stretch I played more live gigs than any other year. "The Question" was a staple set list song. I love it and I remember writing it fondly. Though it still contains two or three recorded errors, I opted to leave it to its studio version, with drums provided by Jeffrey Moscone. Thanks again Jeff for helping bring this alternative track to life. It remains, mistakes and all, one of the more radio friendly songs in the Danny Hauger collection. "Together Now" is available on iTUNES NOW, and $4.99 now on Google Play and on ! (release 2/9/16), iTunes and all digital outlets coming soon! This podcast version is an exclusive, not the album version, and involves a ride cymbal and a live track intro that was a one-take. It was a lot more pure and simple than the final cut. It even has a built in transfer lead that explores subtly in the background. In some ways, I like it more than the more complex final product. "Together Now" will be released this month from my home studios, enjoy the song download, share it, subscribe, and come back to visit often! Have a great week everyone!